I’m back with my continuing adventures of Uncharted 4 with Part 3! Now if you remember, last time I had gone through parts of a prison in Panama that included exploring a really ancient part of the prison, finding an artifact that was a crucifix and happened to be hollow and then trying to escape the prison, but also seeing Nathan’s older brother get shot and dropped from a ledge, seemingly to be killed. Fast forward 15 years later and you see the current Nathan Drake underwater in scuba gear looking for something and that is where I last ended. Time to pick up where I last left off! While Nathan is under water, you can hear him in communication with someone above the surface. There appears to be wreckage of some sort and Nathan is tasked with finding it. Now my thoughts are that he is in the ocean and something fell off a plane and I have to find whatever has been lost and naturally I think it is treasure. The graphics underwater are simply gorgeous and it is cool to see schools of fish swim by as I’m exploring crevices and rocky areas for this apparent wreckage. Something I do want to mention is that in each area you’re in as you progress through the game, you have the opportunity of finding hidden items such as trinkets, coins, and other things. I find some kind of a shark collectible as I’m skimming along the bottom. Eventually I make my way to a piece of metal/wreckage and inform whoever it is above the surface that I am onto something. You’ll also notice that the person above water is concerned about the oxygen level in the tank that Nathan has and at times urges him to come back to the surface and get a fresh tank. Fortunately Nathan says he is good and continues to search. After going past the little bit of wreckage I found, I end up finding more of it such as a tire and then lo and behold I find the main part of what apparently they’ve been looking for. What I come across is a large container that appears it came off of a ship rather than a plane like I originally thought. Nathan informs the person he has been in communication with that they found the container they were looking for. He swims to the other side of it and finds the latch to open the container and swim inside. After some fish swim out, he goes inside and sees towards the back that there are a number of crates in a large bundle of straps though there appear to be 2 of them missing. 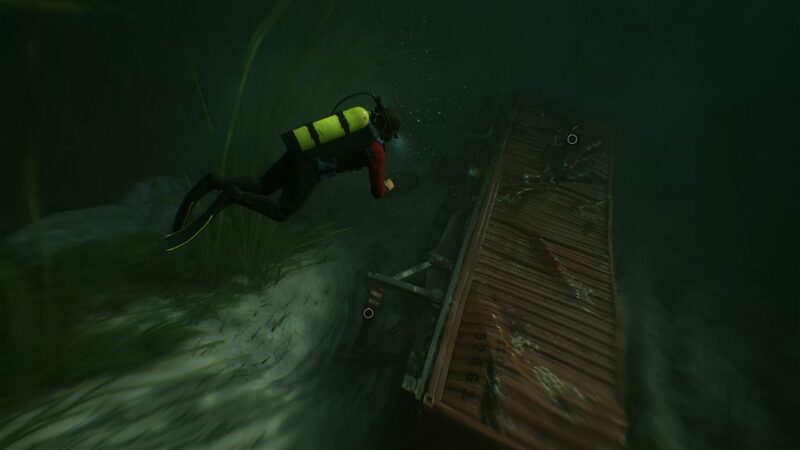 Nathan swims around the container and sees a hole and underneath it is one of the crates, but he is not able to pick it up. He informs the person again of the find and goes searching for the 2nd crate. He doesn’t have to go far to find it and with the press of a button, I’m able to pick it up though I have to press repeatedly a few times to get it into the shipping container. Once Nathan puts it back where it came from, he informs the man above water that they need to send down whatever it is that is used to lift the container so he can he get the last crate. After strapping it to the shipping container, Nathan tells them to raise it a little so he can get the crate underneath. When that is done and safely back into the container, he gets a ride up to the top and you see that instead of an ocean that I thought he was in, it was a river in a large city. As you look around you see that there is a large bridge and apparently a part where a truck went off the bridge. That looks to be the whole reason Nathan was down there in the first place. It also looks like Nathan Drake works for a company that retrieves cargo and other things such as this that happen to fall or get lost in a large body of water. The person Nathan was in communication with is apparently his boss and later tells him of a new job with a potentially big payoff in Malaysia. Nathan however really wants to turn it down because they don’t have the proper permits to search for a lost ship off the coast of Malaysia. His boss at least wants him to sleep on it to which Nathan agrees. The scene changes and the next thing you see is Nathan in an attic sitting at a desk trying to decide if he wants to do this job or not. This seems to be his house that he lives with his wife Elena in. Once Nathan puts away the paper regarding the next job, you’re able to walk about the attic, but notice different things on shelves that you can look at. A lot of these things represent the different quests and finds he has done over the years which mainly include the last 3 games of his adventures. There’s a funny part later on in the attic where he takes a toy gun and shoots at these wooden circles hanging down with different things on them such as monsters and people which I would say are bad people he’s encountered over the years. His wife eventually tells him that dinner is ready and so he climbs down from the attic and is back in the main part of the house. 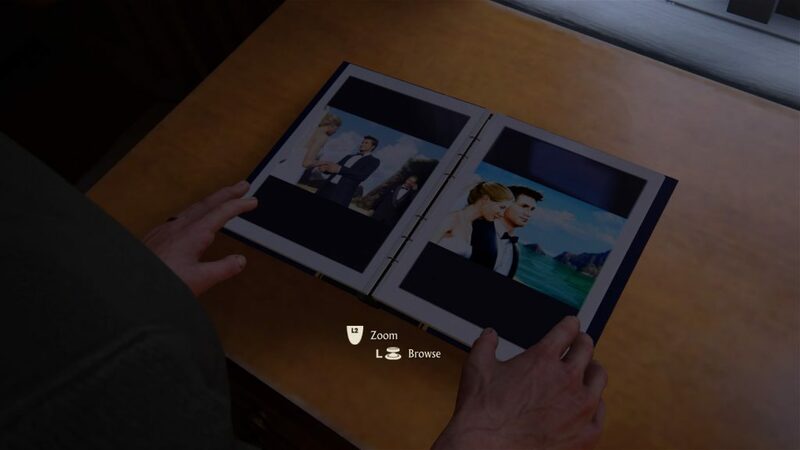 You can walk around and find other things here to look at such as a wedding album and pictures on a camera. He makes his way down stairs, grabs the bowls of dinner after also getting a drink from the fridge and they sit down on the couch and start eating away and making conversation as well. This eventually leads to teasing and Nathan decides to take on a challenge of beating a high score on a video game. Now what is really funny here is that Elena has the very first PlayStation Console and the game Crash Bandicoot! It is so funny to see Nathan playing the game though I’m actually the one controlling it. I don’t beat her high score and Elena torments Nathan once more. Moving on from there, you see Nathan back at his office for the company he works for that retrieves things and all of a sudden gets a knock at his door. He tells whoever the person is that they are closed, but the person keeps knocking anyway. After sighing and saying to himself that he’ll let them in basically, he opens the door and the back of someone and then Nathan asks “Can I help you?”. The person turns around and said he his looking for his little brother that is about Nathan’s height and a little skinnier basically. Nathan is completely stunned to see that his older brother is alive! He asks how this is possible as he had tried to find any signs he was alive after he had escaped the prison. He tells his older brother Sam that he remembers him being shot and then Sam shows the scars of the bullet wounds he received. After doing some catching up and Nathan talking about the adventures he has been on during the last 15 years or so, Nathan wants to introduce him to his wife, but Sam has something else on his mind. He lets Nathan know that he his in big trouble and doesn’t have a lot of time. He informs him about an infamous drug lord that he eventually shared cells with in the prison in Panama and starts to talk about what happens when the next scene switches to the prison and you see Sam in his cell and the drug lord he is talking about. This is also where I end part 3. Well there you have it folks, Uncharted 4 Part 3! There were some interesting things in this part as you see Nathan is married, works for an outfit that does underwater searches and is reunited with his brother. I’ve got all this included in a nearly 40 minute video below so you can see all the detail. Part 4 will be coming soon and will pick back up with Sam in the prison and the drug lord he shared a cell with. As always fell free to comment below! Man, this game is much better than I thought it was going to be! I remember playing the first one and felt it was too much like other games that were out at the time. I beat it but didn’t really feel enthusiastic about getting the second one. But the rave reviews and now reading your article about it is making me second guess starting from the second one and catching up! Glad you liked reading my article! Check at the video as well at the bottom to get a good look at the game as well! I’ve always loved the Uncharted series and I’ve really been liking Uncharted 4 so far. It is definitely selling very well! Hello Defiant6, I really enjoyed reading your page about Uncharted 4. I only played the first two Uncharted games tho and reading this got me wanting to try out this game. the graphics of the game has evolved so much and the game play of Uncharted 4 looks insane. I will have to purchase this game. Uncharted 4 is amazing and so good graphically. I want to get the new Uncharted game that recently came out or add-on I guess you could say.